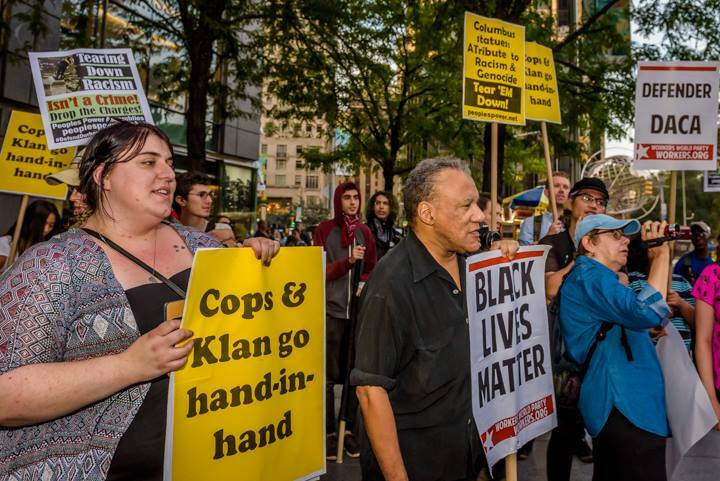 NYC activists stand in solidarity with Durham | Fight Back! New York, NY — On Sept. 12, around 100 activists gathered in Columbus Circle in solidarity with the Durham, North Carolina activists who a month before tore down a statue of a Confederate soldier. On August 14, Worker’s World Party comrades tore down a statue in response to the Neo-nazi and white supremacist violence in Charlottesville, Virginia. Since then, Durham activists have faced political repression in the form of raids and are currently awaiting trial. Last night’s rally and march was part of a series of solidarity events happening throughout the country on the first day of trials. Taryn Fivek, from Worker’s World Party, and Vijou Bryant, from Bayan USA, led the rally and started it off with chants. One of the speakers was Michela Martinazzi from the Freedom Road Socialist Organization. She spoke about how activists should stand in solidarity with Durham activists, and she brought up the Jax5 as an example of fighting political repression. She even touched upon why they were gathered in Columbus Circle: “You see, the Confederacy may have died, but white supremacy is alive and thriving. It's built in the very fabric of our society — from our laws to these disgusting monuments that decorate this country. The rally finished around 8 p.m. and the crowd marched down to Times Square. The march ended in Times Square with activists chanting Assata Shakur’s famous words.